Understanding exposure basics is crucial to making a great photograph. Invest some time to understand the ingredients of exposure. Make sure you read the introduction to exposure first. What is shutter speed? Here we discuss camera shutter speed,and how it affects both exposure and the way motion is rendered. 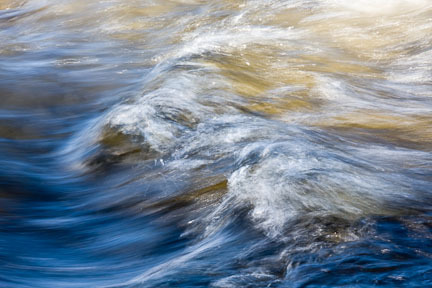 Understanding shutter speed is essential to making a correctly-exposed image. Camera shutter speed is not really a speed, but rather the length of time that the shutter stays open. This controls the amount of light that hits the sensor. Remember: in our our analogy of filling a bucket of water, the shutter speed is equivalent to the length of time we pour. Even though 1/60 is not quite double 1/125, and 1/8 is not quite double 1/30 — close enough! 🙂 These are the standard stops, and the doubling is approximate. This makes sense! If we leave the shutter open for half a second (1/2s), we let in twice as much light as when we leave it open for only a quarter of a second (1/4s). To get the same exposure using a shutter speed of 1/2s or a shutter speed of 1/4s, we would have to compensate by varying one of the other ingredients of exposure: ISO or aperture. For example, if we leave the shutter open half as long, we’d have to open it twice as wide to get an equivalent exposure. 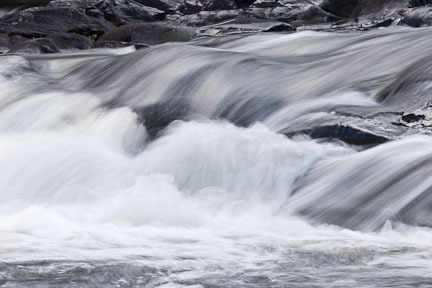 Exposure Basics: How do you choose the right shutter speed? in this case a 1/4 second. Camera shutter speed affects more than just exposure. It also affects the way you capture motion. Think about someone running in front of your camera. If you leave your shutter open for 2 seconds, they will run all the way through your frame while you have the shutter open. 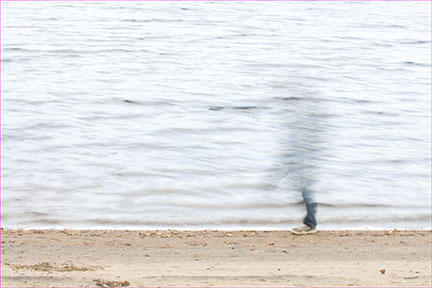 The resulting image will show a blur, or the person may disappear entirely. If, on the other hand, you open the shutter for only 1/100th of a second as the person runs in front of the camera, you will freeze the motion. of a 1/2 second while someone walked through the frame. Check out the following exercise to understand this phenomenon. Exposure Basics: Make someone’s arm disappear! Try the following exercise. 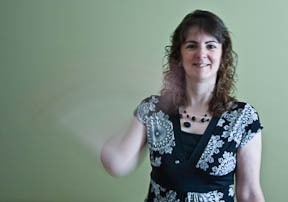 Using a long shutter speed of somewhere around a 1/4 second, take a picture of someone who is slowly waving her arm back and forth. Because the arm moves across the image, it does not stay in one place long enough to register on the film or sensor, and "disappears." Check out the image below to see what happens. Ouch! The subject’s arm disappears. Shutter speed was 1/4s, while subject waved her arm. You can have fun with this effect on a busy sidewalk. Set up your tripod, and use a long exposure of a few seconds (it helps to do this at night, or in low light, so that you don’t overexpose). You’ll end up with ghost trails, and an empty-looking sidewalk, unless there were a few people in the frame who stood still as you made your exposure. 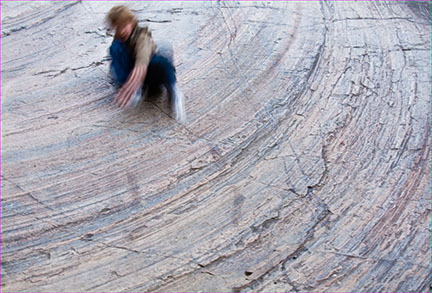 The decision about whether to freeze or blur motion is a creative decision to be made by the photographer. There’s no right or wrong. It just depends on what you’re trying to express. Do you want to freeze running water to see the drops? Use a fast camera shutter speed. Do you want to make the water appear silky smooth? 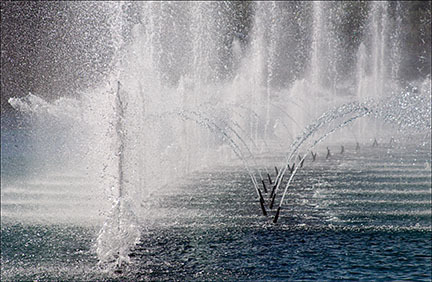 Use a slow camera shutter speed. Neither one is actually the way the human eye sees water. Both are creative, subjective choices. in this case a 1/1000 second. in this case a 1/13 second. You may want to review ISO. Next, read about another of the exposure basics: aperture.